I had to read this book in a day because it was a 14 day check out from the library and I didn't realize I couldn't renew it until the 14th day of "ownership." Therefore I rather flew, skipped and skimmed my way through it to get the general idea of what Crismier was trying to communicate. Being one who is rather given to hospitality and who enjoys having people over and throwing parties, I picked up this book on a whim. I didn't pick it up so much for the encouragement to "try" so much as to beef up my feelings of Why This Should Be So For Everyone. I find the topic curious. Crismier does a pretty good job of Biblically suggesting why we are to be "given to" hospitality (and not necessarily "gifted in" before we give it a try)! I do think he stretches some of his Biblical examples but I agree that the basic scriptural directive to have open hearts towards each other remains. His basic premise seems to be that we are blessed so that we can bless others. Hospitality is kingdom work. It is not meant for only certain classes or people of certain status. It is meant for all. It should not matter whether your house is large or small, whether you are black or white, single or married, rich or poor. Everyone has been given something to share and he suggests that the best way to build a kingdom community is to share what we have. Open hearts and open homes. The thing I did not like about his book, and truthfully found completey distracting, was that it felt like he wrote it in pieces and then in the end he threw all his chapters together in some random order. It felt like he didn't realize that in so doing, he had repeated himself in other chapters and then just forgot. He gave the same statistics, same quotes and, on occassion, told the same stories several times. It made me wonder if an editor was involved at all. Despite this, it is a good reminder that we are to care more for the needs of others than for ourselves. Personally, if I were to recommend a book on hospitality, I would recommend the book Face to Face: Meditations on Friendship and Hospitality by Steve Wilkins (published by Cannon Press). I think Face to Face has better flow, is more scripturally on point, and skips giving the napkin folding/table decorating suggestions at the back of the book. I think such suggestions are better found in Martha Stewart magazines than in a scriptural thesis on the subject. 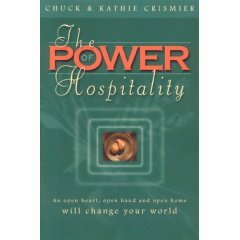 Nevertheless, when there are so few books on a topic, The Power of Hospitality is not a bad one to pick up. Just perhaps not the best. Thanks so much for your review. It was an excellent overview. I will take a look at the book, and the other one you suggested as well.